Look up while you’re visiting Congaree National Park and you’ll see the park’s stunning bottomland hardwood forest canopy 100 feet above you. This park, located just 18 miles southeast of Columbia, South Carolina, is home to a number of national and state champion trees and has one of the tallest deciduous forests in the world. It’s taller than old-growth forests in Japan, the Himalayas, South America and Eastern Europe. 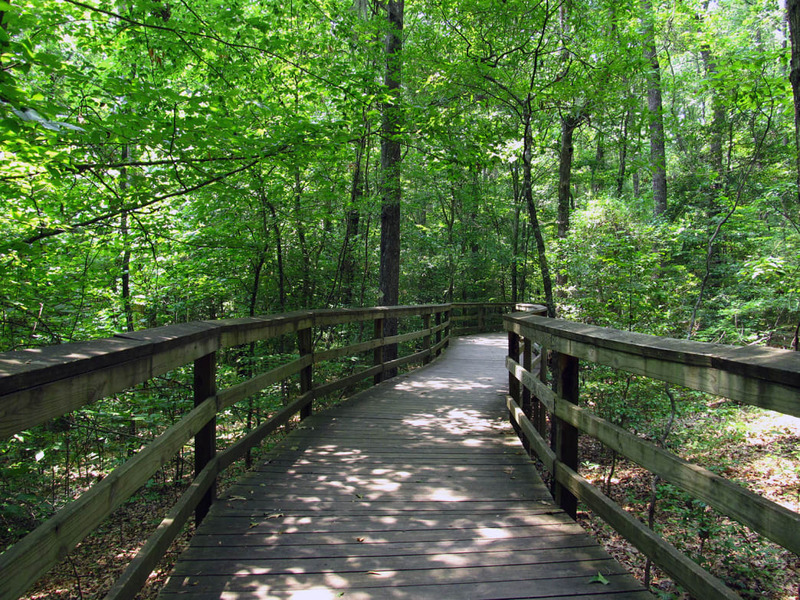 Congaree National Park is bordered to the south by the Congaree River, which creates slow-moving creeks, oxbow lakes, and swampy areas throughout the park. The river’s waters carry nutrients and sediments through the park that fortify the forested wetlands. The area was named a national park in 2003 with a goal of preserving this southern hardwood forest. The park, which is home to tree species such as the bald cypress, water tupelo and pines, encompasses 27,000 acres. Most trails in Congaree National Park are in a floodplain, which means the terrain is generally very flat. The Bates Ferry Trail is a 2-mile out-and-back route in the eastern section of the park that follows a historic ferry road used to transport people, livestock, crops, and other items to South Carolina cities. It ends at Bates Ferry landing, which provides an overlook of the Congaree River. The Sims Trail is a 1.3-mile route that follows an old gravel road and runs from the Bluff Trail south to Cedar Creek. On this hike, you’re likely to spot box turtles, fox squirrels, deer, and dozens of types of birds, including several species of woodpeckers and warblers. Nearby, the 1.7-mile Bluff Trail loops north of the visitor center and passes through a forest of gangly loblolly and longleaf pines. You’ll see evidence of prescribed burns here and you can access the park’s two camping areas, the Longleaf and Bluff campgrounds, from this trail. For great views of otters and wading birds, such as herons and storks, consider the 4.4-mile Weston Lake Loop Trail. This route takes hikers near Cedar Creek and a dried-up river bed where many “cypress knees” stick out of the water. These funky looking cone-shaped formations grow above the roots of cypress trees. Immerse yourself in old-growth trees and pass by a number of low-lying sloughs on the 6.6-mile Oakridge Trail. You’re likely to spot deer and wild turkey on this route, which connects with the Kingslake and River trails. Birders flock to the 11.7-mile out-and-back Kingsnake Trail because it travels near Cedar Creek and affords views many bird species, including red-shouldered hawks, yellow-billed cuckoos and chimney swifts. Kayaking or canoeing the park’s Cedar Creek is an incredible way to see the old-growth forest from a new perspective. The Cedar Creek Canoe Trail, which is approximately 15 miles long, starts at Bannister’s Bridge and ends at the Congaree River. From your vessel, you may spot deer and river otter, along with plenty of wading birds. If you’re new to paddling, consider a ranger-guided canoe tour, which are offered a limited number of times throughout the year. Participate in the Big Tree Hike, a five-mile, off-trail walk led by a volunteer naturalist. Your guide will show you some of the park’s champion trees, including the national champion loblolly pine, which is 167 feet tall and almost 15 feet in circumference. In May and June, you can watch nature’s own light show as the park plays host to synchronized lightning bugs. The park is one of the few easily accessible locations in the country where you can see lightning bugs light up in unison, rather than sporadically. This mesmerizing experience is part of a mating ritual for a species of firefly that lives at the park. 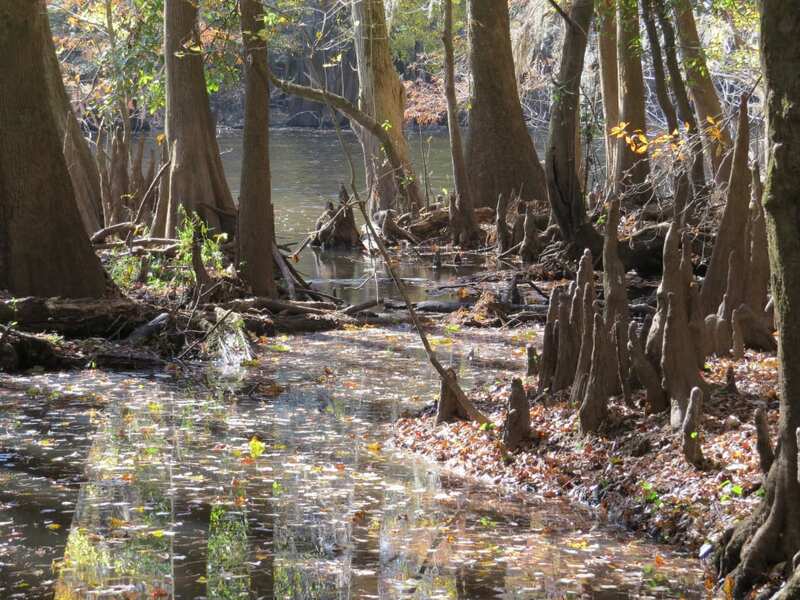 Visit the park by way of the Congaree River Blue Trail, a 50-mile recreational paddling trail that starts in Columbia and ends downstream in Congaree National Park. You’ll start with urban scenery and end in the park’s lush green forest. Along the way, you’ll see high bluffs and views of the Coastal Plains region. You can camp throughout the park’s backcountry, which can be reached by canoe, kayak, or by hiking. While there are no designated backcountry sites, make sure to stay at least 100 feet away from Cedar Creek, Tom’s Creek, Bates Old River, and Wise Lake. The 10-mile River Trail leads to the Congaree River, where you’ll be immersed in the park’s diverse ecosystem. 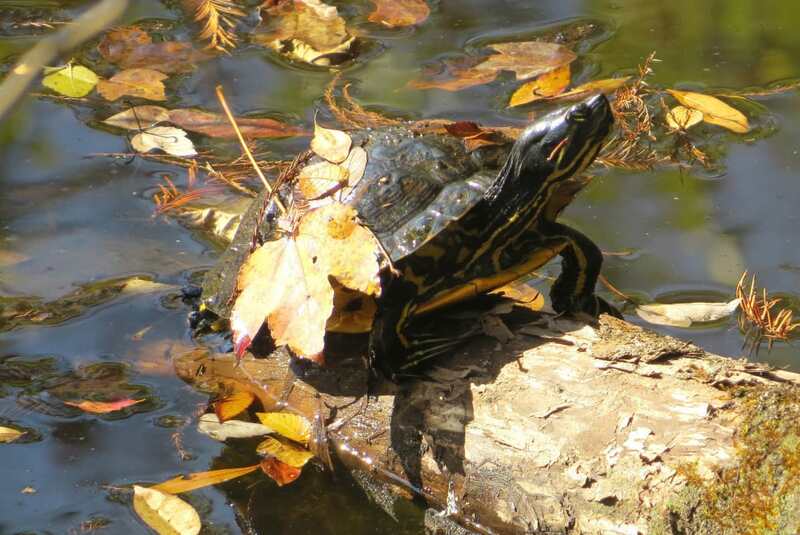 On this hike, you’ll pass through dense vegetation and you may catch a glimpse of a yellow-bellied slider turtle or a long-tailed salamander. The river overflows its banks ten times a year, but when the water is low, you’ll see a large sandbar. If you opt to canoe or kayak down Cedar Creek, be prepared to run into downed trees and log jams. You may need to portage around these obstacles. Also be wary of poison ivy, spiders, wasps and snakes, which like to hang out near downed trees. Visit in the fall for optimal leaf-peeping opportunities. Fall colors peak here in late October and early November. From September to November, the park averages daily temperatures in the 70s with low humidity. If you do visit during the summer months, expect high humidity and high temperatures. Thunderstorms are common from June to August and the park receives approximately 4.5 inches of rain per month. Though backcountry camping is free, the park requires you to register at the visitor’s center before you set out. Fishing is allowed in the park with a South Carolina fishing license. Congaree is one of the more dog-friendly national parks, so consider bringing your four-legged friends. Dogs are allowed on all trails, but they must be kept on a leash and cannot be left unattended. There are no designated bike trails in the park, so hiking and paddling are your main recreation options. If you’re short on time, walk the 2.4-mile Boardwalk Trail. It’s stroller and wheelchair accessible, plus you can pick up a self-guided boardwalk tour brochure at the visitor center to learn about the park. Watch out for snakes. Three venomous snakes, the water moccasin, the copperhead and the canebrake rattlesnake, are a common sight along trails, in tall grasses and near downed trees. Written by Sarah Kuta for RootsRated. Be the first to know about special sales, events, new products, and more. We exist to encourage people to get outdoors.